Athenos arrived to Back to Nature in summer 2006. He was a transfer from Fallin’ Pines Critter Rescue in Christmas, Florida. He was part of the wildlife pet trade and was later a discarded pet. When he was surrendered he was estimated to be about 5 years olds and 10 pounds. Athenos was originally given the name Athena when he was first thought to be a female. Once he began to mature, it was determined that he was a male and the name was changed to Athenos. As a domestic pet and a non-native species, Athenos is non-releasable. Most often, African tortoises become throw away pets due to their rapid growth, appetite, destructive capabilities, and life span. 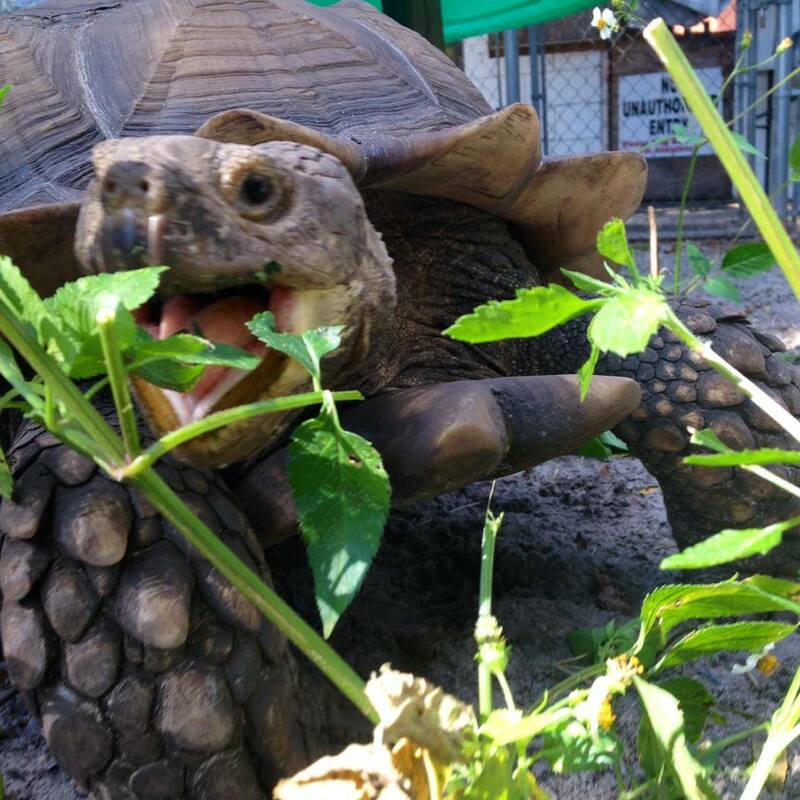 *Athenos has been given the nickname “Bulldozer” because he loves to knock anything and everything over that is placed in his enclosure. 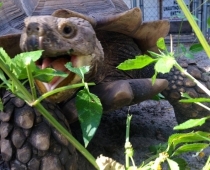 The African spurred tortoise is native to the Sahara and the Sahel, a transitional ecoregion of semiarid grasslands, savannas, and thorn shrublands found in the countries of Burkina Faso, Chad, Eritrea, Ethiopia, Mali, Mauritania, Nigeria, Senegal, and Sudan. In these arid regions, the tortoise excavates burrows in the ground to get to areas with higher moisture levels, and spends the hottest part of the day in these burrows. This is known as aestivation . Burrows may average 30 inches in depth; some dig tunnel systems extending 10 feet or more underground. 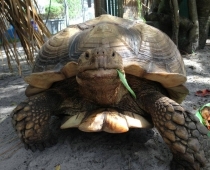 G. sulcata is the third-largest species of tortoise in the world after the Galapagos Tortoise, and Aldabra Giant Tortoise, and the largest of the mainland tortoises. Adults are usually 24 to 36 in long (60–90 cm) and can weigh 100-200 lb (45 – 91 kg). They grow from hatchling size (2–3 in) very quickly, reaching 6-10 in (15–25 cm) within the first few years of their lives. 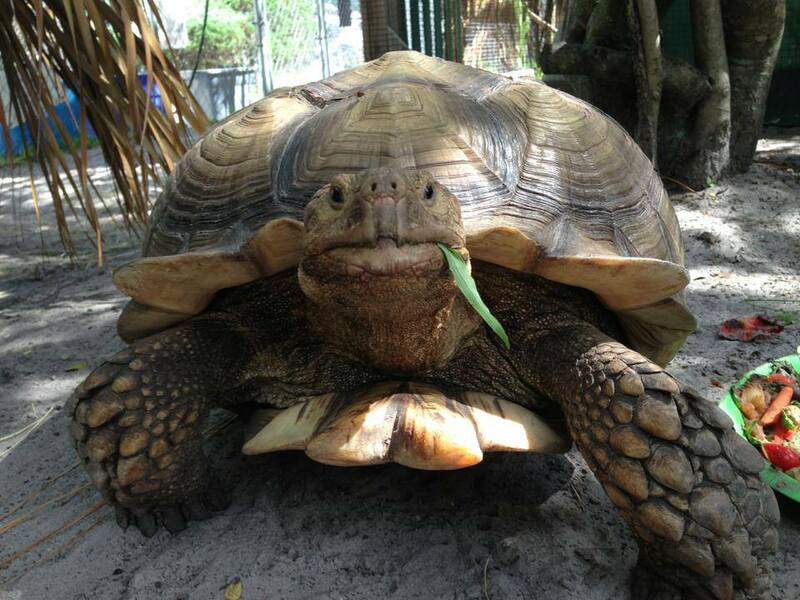 The lifespan of an African spurred tortoise is about 50–150 years, though they can live much longer.